During the muscle car craze of the 1960s, each of the Big Three branded a special name on their most coveted muscle cars. These were their cream of the crop, crown jewel, or top shelf muscle machines. The cars that outshined the rest of the pack and the ones that are still legendary today. Chevrolet adopted the SS moniker for its greatest muscle machines. Ford bequeathed their top brass the GT designation. Dodge bestowed the R/T badge to its most coveted muscle. In this edition of Muscle Car Milestones, we’ll take a look at the 1967 Dodge Coronet R/T. This was Dodge’s first car to display the R/T badge. Dodge was out to send a wake up call to the guys driving the GTOs and Fairlanes. You’ve been put on notice and things around here are going to change. You’re not the only game in town any longer. The Coronet was completely restyled in 1966 under the direction of Chrysler’s Chief Stylist Elwood Engel. Engel’s designs had remedied the mediocre styling of previous Chrysler products and the Coronet’s design was no exception. The new R/T was available as a hardtop coupe or a convertible for those willing to whip out a little extra dough. The Coronet R/T featured Charger-inspired grille work, nonfunctional hood scoops, and louvered taillamps. R/T badging is prominently displayed on the grille, rear quarters, and tail section. Chrome bumpers and mirrors along with brightwork on the window trim, rocker panels, and wheel wells add a little extra flair to this pavement pounder. A lower-body paint stripe was also available as a dealer option for drivers wanting some extra styling cues. The standard wheel was a 14 x 5.5 inch steel wheel with dog-dish style hub caps. Mag-type wheel covers and chrome Magnum 500 wheels were also available as options. 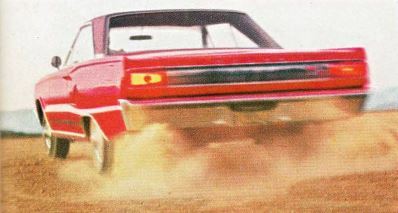 Red Streak tires were standard issue on all three wheel choices. The interior of the Coronet R/T included amenities such as vinyl bucket seats, vent windows, and stainless trim on the dashboard and doors. Features such as a dash cluster with a 150 mph speedometer along with fuel, temperature, alternator, and clock keep the finger on the pulse of what’s going on under the hood. R/T badging on the doors and full carpeting round out the goodies located inside the cockpit. Buyers could also check off options such as a tachometer and electric windows on the option sheet. Another nice choice was a center console with floor shifter or a fold-down center armrest with column shifter for the Coronet R/T. 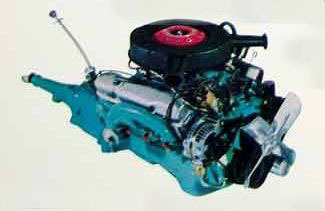 The base engine for the Coronet R/T was a 440 Magnum V8 that produced 375 horsepower and 480 ft-lb of torque. It could be mated to either an A-727 TorqueFlite 3-speed auto with column shifter or an A-833 4-speed manual on the floor. However, for those wanting to strike fear in the hearts of the Blue Oval and Chevy guys, Dodge served up a formidable 426 Hemi. This twin carbed powerplant was rated at 425 horsepower and 490 ft-lb of torque. Hemi-powered Coronets are rare since this engine tacked on an additional $1,100 to the price tag and only a few buyers were willing to shell out the extra dough. 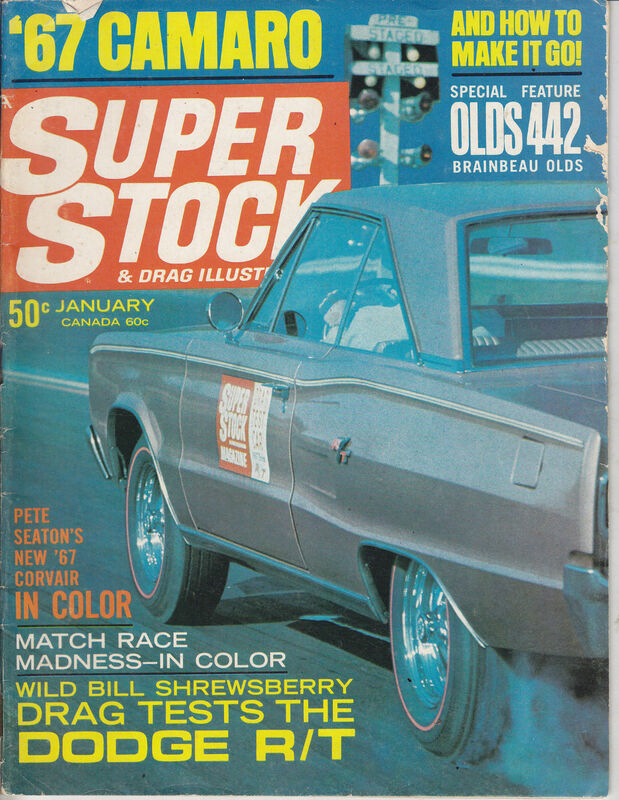 For the January 1967 issue of Super Stock Magazine, famed drag racer “Wild Bill” Shrewsberry was asked to put the Coronet R/T through its paces. Shrewsberry’s car was outfitted with the 440 Magnum and TorqueFlite 3-speed transmission. Several drags were made with the car which resulted in the best time recorded at 14.35 seconds running 99 mph. 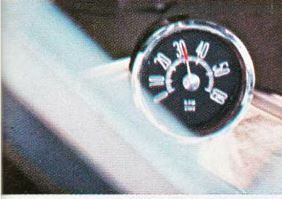 Similarly, Motor Trend tested the car for their June 1967 issue. Their car was also outfitted with the 440 Magnum and TorqueFlite automatic transmission. They recorded quarter mile times between 14.7 and 15.4 with their Coronet. They also ran the car numerous times from 0-60 and recorded a best time of 6.5 seconds. So, how does the Coronet R/T stack up against its fiercest competitors from GM and Ford? Actually, pretty well once you compare the stats. Car Life Magazine tested a 1967 Pontiac GTO equipped with a 400 cubic-inch V8 and 3-speed automatic. Rated at 360 horsepower and 438 ft-lb of torque, the GTO ran from 0-60 in 6.1 seconds and the Goat dashed the quarter mile in 14.5 seconds. Clearly, just a little bit faster than the R/T. However, it was no contest when compared to the 1967 Ford Fairlane GTA. The Fairlane’s 390 cubic-inch V8 produces 320 horsepower and 427 ft-lb of torque. It was also equipped with a 3-speed automatic transmission. Motor Trend recorded a 0-60 run in 8.1 seconds and completed the quarter mile in 16.2 seconds. Hands down, the R/T with more 55 more horsepower bests the Fairlane in both categories. A recent search of auction and classified sites shows prices for a 1967 Coronet R/T range from quite affordable to lavishly expensive. In September 2013, Mecum Auctions had up for bid an unrestored 440 R/T automatic. When the gavel fell, the winning bidder walked away with this car for $18,500. On the opposite end of the spectrum, a recent search on AutoTrader Classics reveals a Hemi 426 with TorqueFlite transmission listed for $72,500. This price seems high but keep in mind, only 238 Hemi powered Coronets with the 426 were produced in 1967. That’s the price you pay for exclusivity. 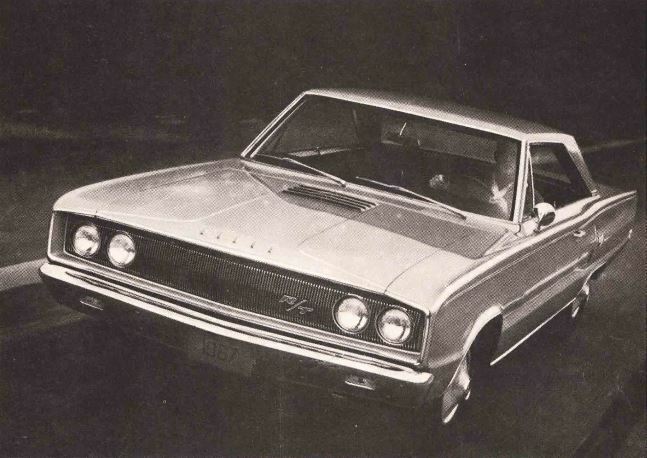 Dodge produced a few ads for the 1967 Coronet R/T. One ad depicts the car being driven on a country road and taken racing on a drag strip. The car is tagged as “the newest hot one from Dodge”. Features such as the available tachometer, Red Streak tires, and hood scoop are prominently featured. 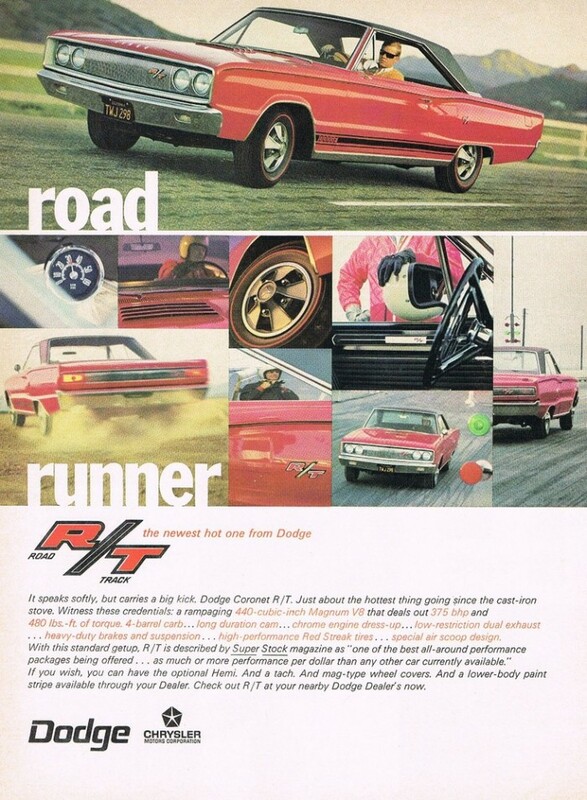 Another full-color ad starring a red Coronet R/T touts the highlights of the car. Attributes such as the 440 Magnum engine, suspension, and exhaust are emphasized. 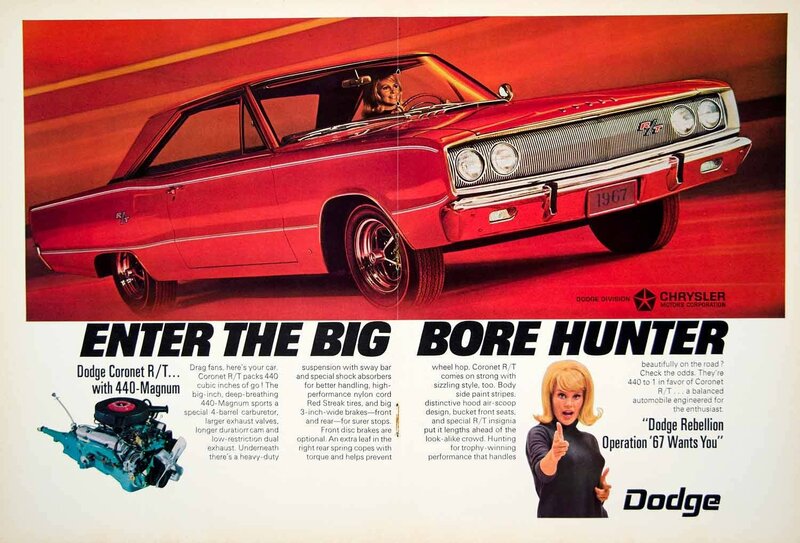 The tag line “Enter The Big Bore Hunter” is Dodge’s subtle way of saying the car is anything but ordinary. Fast forward 46 years and the R/T name is still legendary. Today, the badge is proudly displayed on the modern day interpretations of the Charger and Challenger. Heck, even the Durango SUV has an R/T version. Make no mistake, these vehicles are at home on the road as well as the track.